By Neil Haydock, Watergate Bay Hotel in Newquay. In a large pan of boiling water cook the rice for 5 minutes before draining, refreshing under cold water and draining. Place the milk, sugar, vanilla and rice into as saucepan and bring to a simmer. Cook for around 25 minutes stirring occasionally to stop the rice from sticking until cooked add a little more milk if required. Allow the rice to cool stirring occasionally to prevent skinning. When the rice is at room temperature lightly whip the double cream and fold through the rice pudding and divide evenly into serving glasses. Cut the rhubarb into 3cm lengths. In a saucepan bring the sugar and water to a boil and reduce until a syrup forms before adding the rhubarb, simmer until the rhubarb is tender. Remove from the syrup and reduce the syrup until a coating consistency is achieved. Pre heat the oven to 120 degrees. Break up the ginger cake into crouton size pieces and place on a baking tray and place in the oven for 30 minutes until dry and crunchy. Pop the ginger cake into a food processor and blitz into a fine crumb. 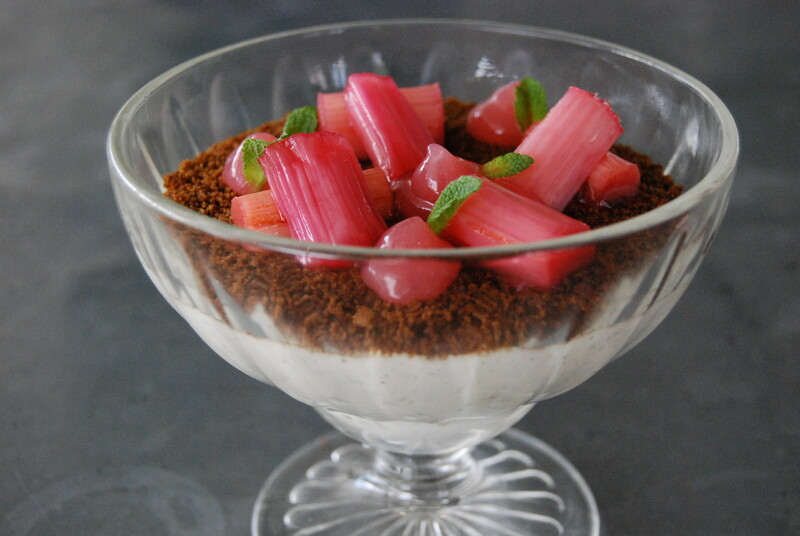 Sprinkle a fine layer of the crumb over the rice pudding followed by the rhubarb and spoon over the syrup before serving.